In his account of the life and times of Oscar Wilde – which is witty and intelligent enough to match the man himself – Matthew Sturgis takes a look at the smoking habits of the 19th century’s most renowned dandy. ‘Do you smoke?’ Lady Bracknell inquires sternly of Jack Worthing, in The Importance of Being Earnest, assessing his suitability as a suitor for her daughter’s hand. 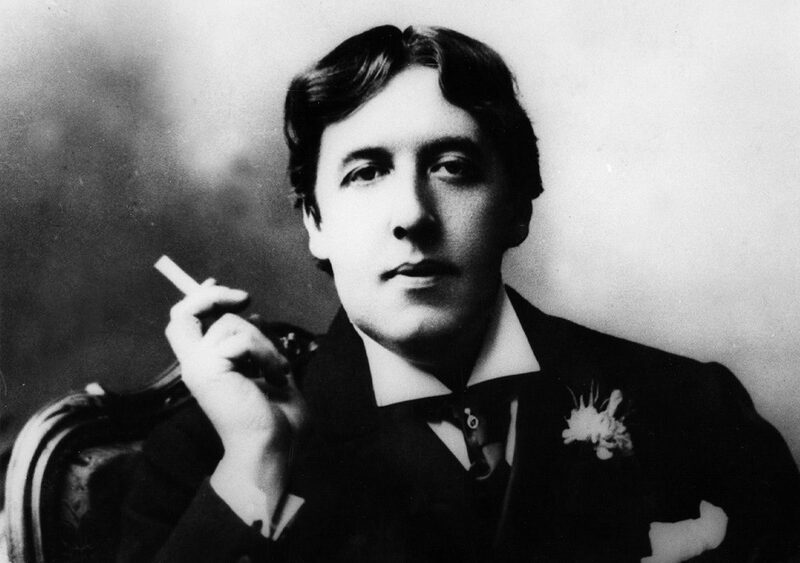 Wilde, himself, was certainly not idle when it came to smoking. He recognised that, like all pleasures, it was something to be taken seriously. He devoted time, money and wit to matter. And, indeed, his whole career – from early promise, through initial frustrations, eventual success, and disastrous fall, to unchastened exile and early death – has to be followed through clouds of smoke. He seems to have discovered the joys of tobacco as an undergraduate at Oxford. His boarding school in Ireland had been fiercely anti-smoking, even going to the length of printing ‘pledge’ cards for the pupils, stating: ‘I faithfully promise that as long as I am a Pupil at Portora, I shall never Smoke.’ Wilde’s Oxford contemporaries, though, recalled how, at the jolly parties he hosted in his college rooms, he would provide not only bowls of punch but also ‘long churchwarden pipes with a brand of choice tobacco’. They stimulated both merriment and wit. His friends describe him, when in company, with a cigarette almost always in his hand. He would light one, take only a few drags and then discard it, before – moments later – lighting another. Like many late 19th-century cigarette smokers, he does not seem to have inhaled. One of the earliest of his sayings to be repeated in the press concerned the pleasures of smoking, and the irritation of having to wait until after dinner, before one could light up of an evening. At a London society dinner party, the hostess lamented to him that the wick of one of the lamps on the dining table had been ‘smoking all evening’. ‘Happy lamp,’ Wilde answered gravely. Wilde came to favour Turkish tobacco, with its rich sun-dried aroma and mild flavour. One of the small vexations of his year-long lecture tour of America in 1882, was that he soon ran through his supply of Turkish cigarettes and had to fall back on the lesser pleasures of American tobacco. He came to favour a brand called ‘Old Judge’ – although a San Franciscan tobacconist paid him the compliment of mixing up a special blend called ‘Oscar Wilde’. Wilde recognised, though, that a cigarette was not just for smoking. It could serve as a useful prop: to punctuate a sentence or mark a moment. When faced by an importunate New York reporter asking unwelcome questions about an incident in which he had nearly been fleeced by a gang of con-artists, Wilde gained time by taking a very long drag, and an equally long exhalation, before answering cryptically, ‘I should object to losing $1,000, but I should not object to have it known if I had done so.’ The French writer Leon Daudet recorded how Wilde would always literally point out the incidents of his spoken stories and parables with his cigarette. In telling of the Fisherman and the Mermaid, for instance, ‘as he pronounced the word “sirène,” he raised his left hand up even with his right, which was holding his cigarette, and blew the smoke between them.’ The effect was mesmerising. Scarcely less mesmerising was the practice Wilde instituted amongst his young male friends and lovers. If anyone asked for a cigarette, the giver would light it himself, take a preliminary drag, and only then pass it over to the recipient. The young Parisian poet, Pierre Louÿs, thought the custom touched with poetry. Others were less sure. Cigarettes, certainly, possessed the power to shock, as Wilde well knew. He would, however, be both bemused and amused at the modern demonisation of smoking. Indeed, when being shown over the Cincinnati School of Design in 1882, he was amazed to see a large ‘No Smoking’ sign. ‘Great heaven,’ he exclaimed, ‘they speak of smoking as if it were a crime. I wonder they do not caution the students not to murder each other on the landings.’ In England, disapproval tended to be rather more oblique. If Wilde enjoyed smoking, he enjoyed too all the paraphernalia associated with it. Many of the journalists who interviewed him during his American tour noted his elegant amber cigarette-holder. And in an age when cigarettes were sold loose, he recognised the virtues of a handsome cigarette case. And the dangers too. The comic action of his last play, The Importance of Being Earnest, is set in motion when Algernon reads a puzzling inscription in the cigarette case of his friend Jack. ‘It is a very ungentlemanly thing to read a private cigarette case,’ Jack protests in vain. The comedy of this line had its tragic sequel later that year (1895) when Wilde’s own habit of giving expensively engraved silver cigarette cases to the young rent-boys and pick-ups with whom he slept, was exposed in court. It was part of the evidence used to incriminate him. ‘I have a great fancy for giving cigarette cases,’ Oscar protested - but in vain. The jury was not convinced. Convicted of gross indecency with the various recipients of the said cigarette cases, he was sentenced to two years hard labour. Not the least of the hardships of prison life was the absence of tobacco. And not least of the consolations of Wilde’s last years of freedom and exile, was being able to smoke again. Unable to work in any sustained way, bereft of congenial company for long stretches of time, smoking, as Lady Bracknell would have recognised, gave him not merely a pleasure, but an occupation.